As social media progresses at a faster pace than ever before, so do romantic relationships across them. 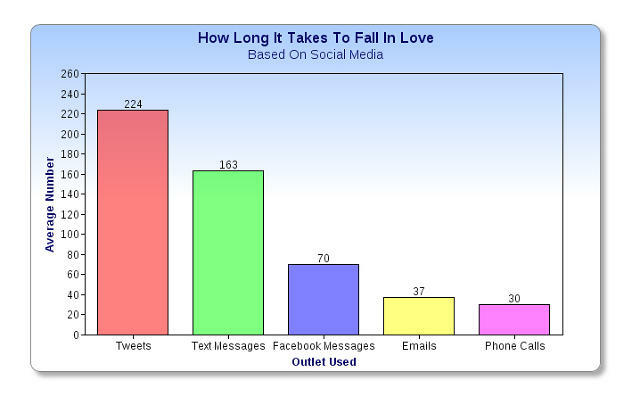 In the digital age of Facebook, Twitter, Instagram and similar social networking sites, the speed of falling in love has accelerated. Within an instant you’ve become Facebook friends, you’re following him on Instagram and Twitter, and quite possibly, you’ve taken the chats to Facebook’s inbox messaging or Twitter’s direct messaging, or to the ever-popular WhatsApp instant messaging service. A new study by UK electronics retailer Pixmania has revealed young people are becoming couples faster than ever before, thanks to the progression of social media. Here’s a breakdown on how much digital data it takes to fall in love Couples over the age of 55 said that on average it took more than two-and-a-half months to become official. Contemporary couples do it quicker, with a reported average of 24 days before the “boyfriend” or “girlfriend” term becomes applicable. The key difference is the use of technology and its availability. In the past it was phone calls every other day, or rarely ever, but new couples have the ability to be in constant contact. Therefore the study concluded it takes an average of 224 tweets, 163 text messages, 70 Facebook messages, 37 e-mails, and just 30 phone calls for new-generation couples to fall for each other. If you’re a newbie to social media and technology then you’re probably at a loss as to how so many messages and calls can take place within the space of a few weeks, but ask any young social media-savvy person – it’s not a lot if you’re constantly hooked to your mobile phone. Of course, if you live by the sword, you die by the sword. The study revealed it’s no longer a douche-bag move to break up with someone via text; 27 per cent of its participants are perfectly content to break up with someone via text message.